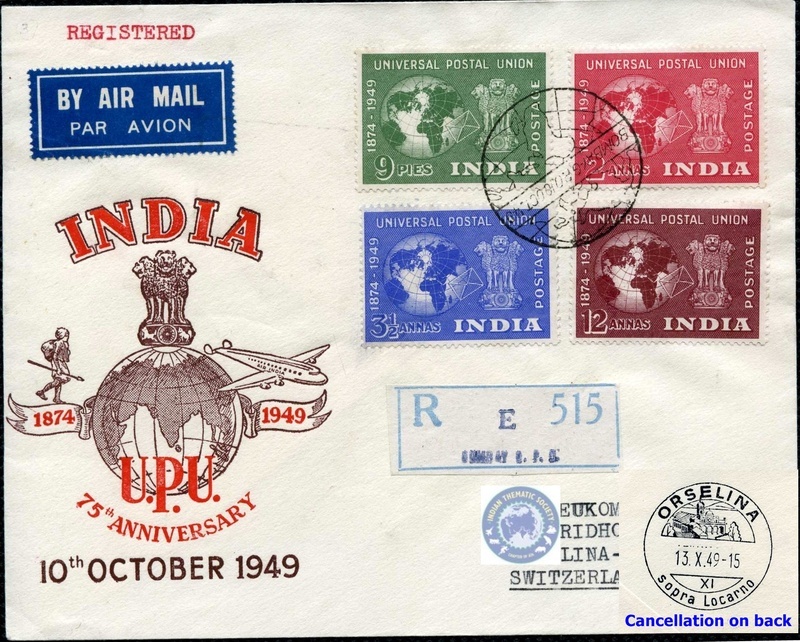 The 1865 postage stamps were not required to be affixed to the official correspondence in India. 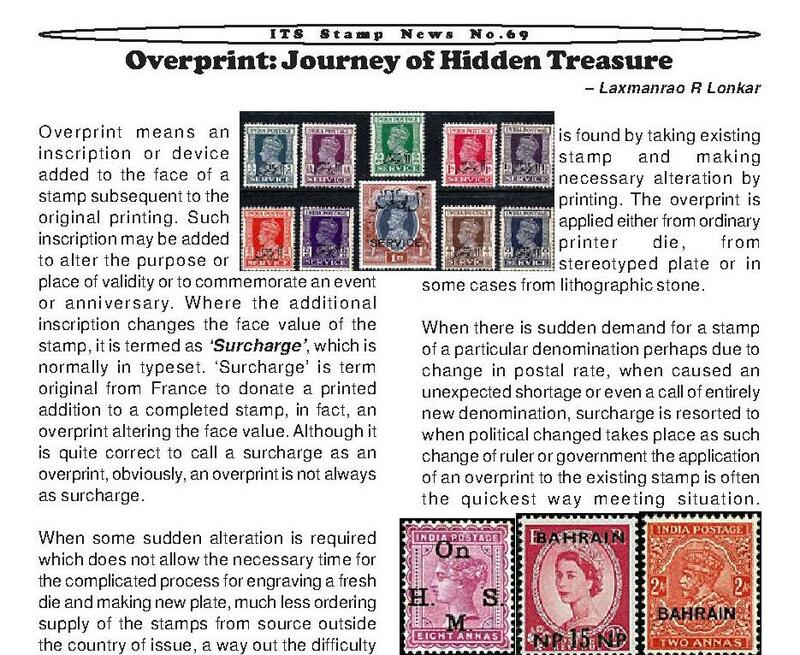 To distinguish official correspondence and to maintain separate account, ordinary stamps are overprinted as “SERVICE” from 1st August 1866. The service stamps are overprinted as “Kaj Sarkari”, On Government, Official Business, On Her / His Majesty Service, Resmi Official, On State Service, Service Official etc. Read More…. 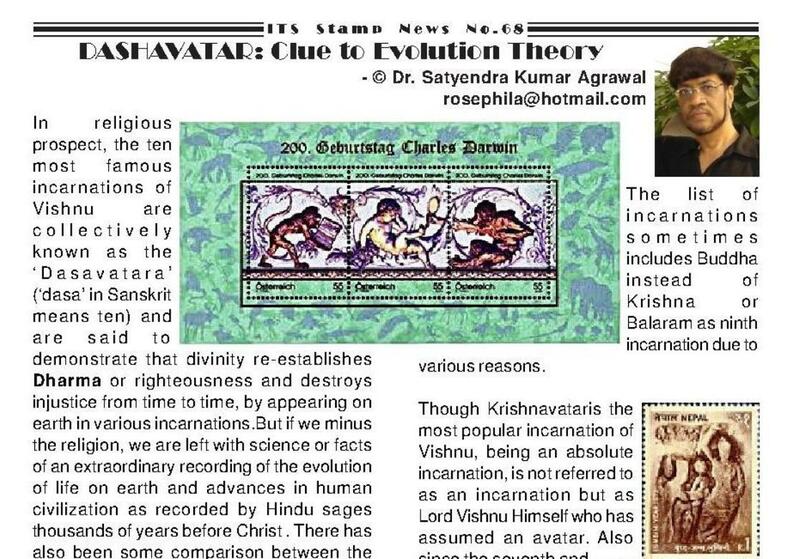 in Issue No.69 of "ITS Stamp News"
There has also been some comparison between the avatars of Vishnu and Darwin’s Theory of Evolution, as the incarnations generally mirror increasing phylogenetic sophistication in keeping with the theory’s proposal of terrestrial reptiles and mammals evolving from aquatic and amphibian life. Read More…. 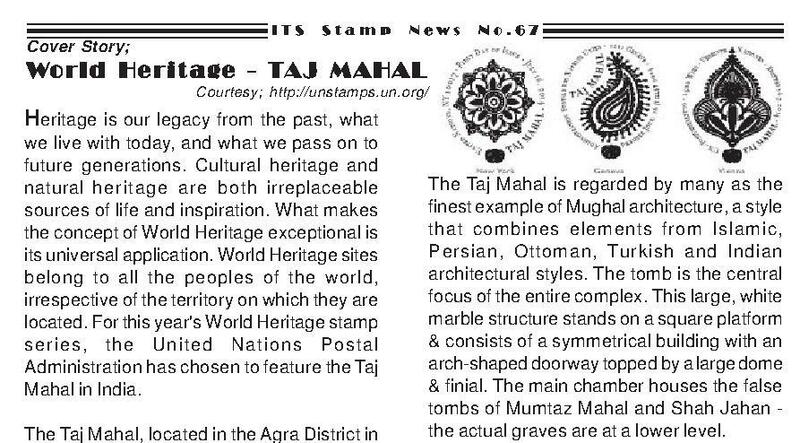 in Issue No.68 of "ITS Stamp News"
The Taj Mahal was listed as a UNESCO World Heritage Site in 1983. This remarkable structure's enduring aesthetic quality represents a timeless testimony to the love of Shah Jahan for his beloved wife. Women by the side of their reputed spouse, who were also Indian social workers and politicians, form the other group of Indian women, who helped to better the future of Indian women. India Post did issue some famous and some unknown couples on the postage stamps. The first and foremost of these is Mrs. Kasturba Gandhi and Mahatma Gandhi. In his biography “My experiments with Truth”, Mahatma Gandhi has clearly and openly written how he has behaved with his wife in order to force her to wash the latrines and other petty small works. There might be hardly any other Indian lady or wife of a dignitary who has suffered often as she was a bold personality. Postal Stationery: India has issued many post cards with advertisements of cycle industries, like TI, Hercules, Atlas, Avon, Sen Raleigh etc. 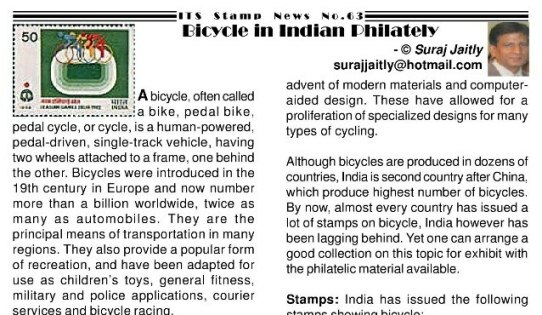 Some of Cycle manufacturers in India have also issued private postal stationery with their own advertisements. In this category we can find Road Master of India, Rapid Cycle, Ralson, Metro, Atlas etc. 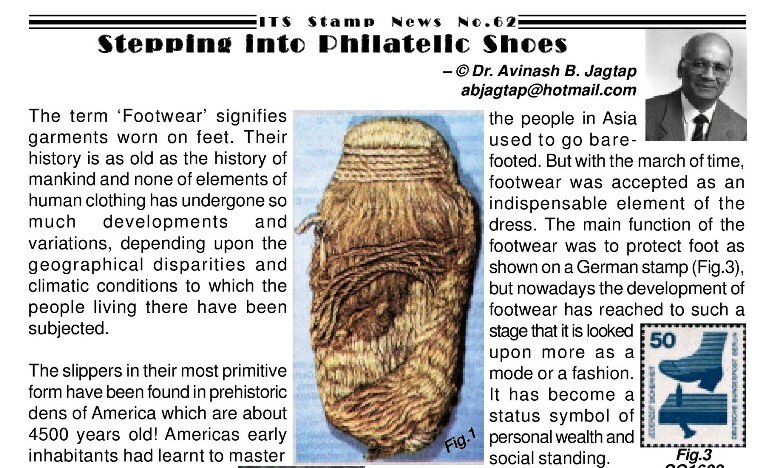 In the beginning the fibrous leavesof plants served as the most appropriate material for wicker-work towards theformation of footwear as it is seen in the ancient specimens of footwear foundin Missouri caves. Leather was the material of choice, as a durable and ofcompatible nature to the human skin than any other material. Religious beliefs play important roles in Asian literature. Religious tales were recorded in the form of manuscripts, beys-relief, sculptures, and mural paintings. 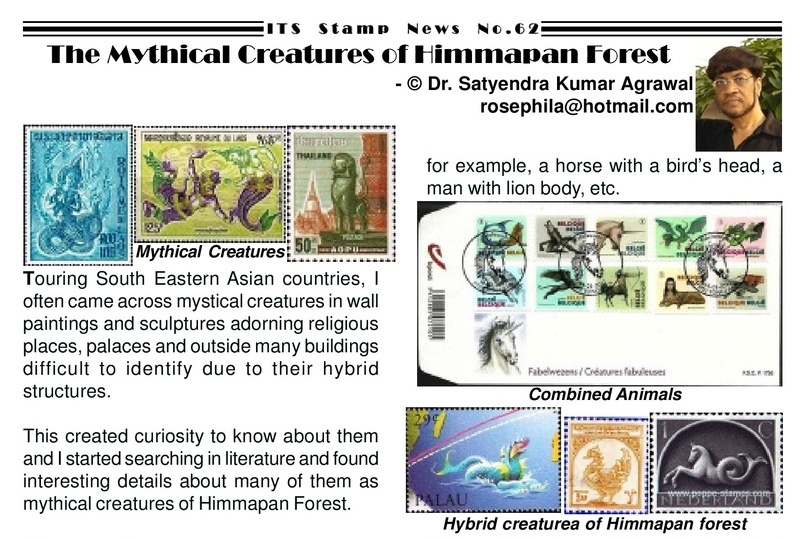 Two prominent religions mentioning tales of Himmapan creatures are Hinduism and Buddhism. These creatures may be deities, semi-deities or demons.